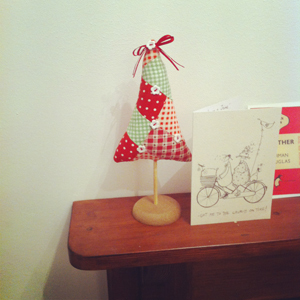 Today I had an amazing charity shop find..
It’s a tiny Christmas tree! In my excitement I was inspired to make a Christmas themed post to show some of my previous Xmas card designs. Whether I’ll do any new designs this year is yet to be seen, mostly it will depend if I can fit it in my busy schedule of being unemployed, sorting the house and generally socialising (also I am working on a secret project). Rather than doing lots of different designs I opted for one design with 3 different coloured versions. Above is the blue version, there were also pink and green versions. I liked how all the different snowmen had their own quirks and personalities. 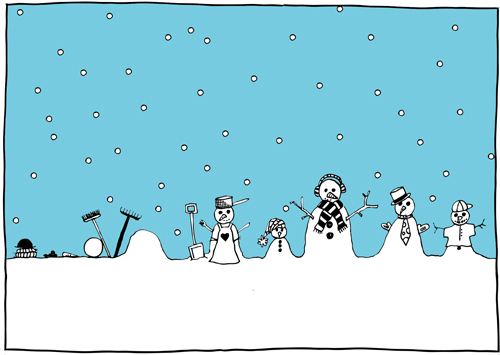 There is still one snowman to be left to be made and you can work out a bit about his personality and imagine how he’ll look from the items waiting ready to build him. 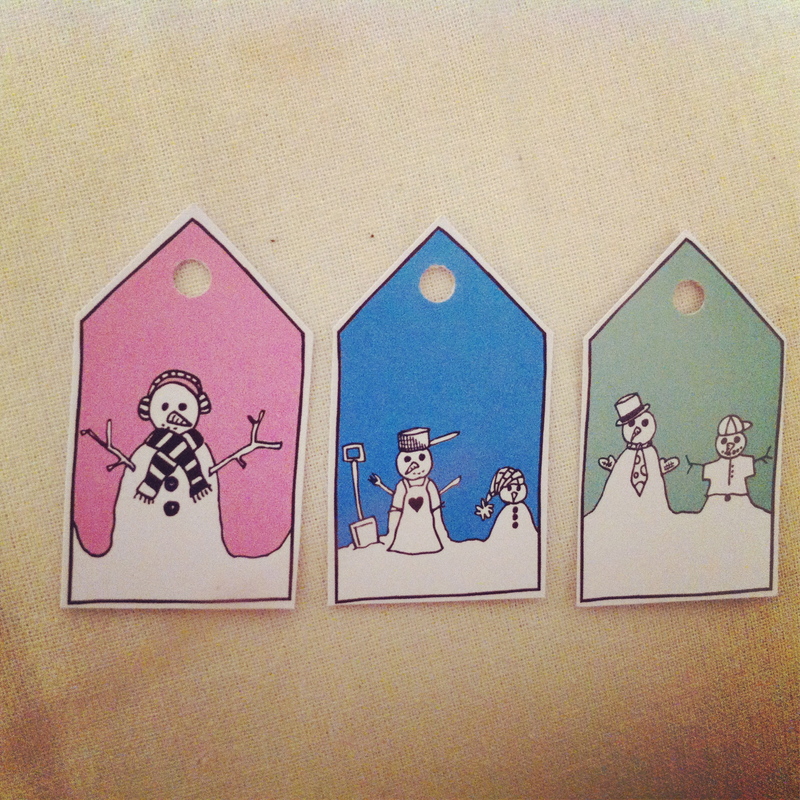 I also made a few gift tags that I used on presents last year. They looked really good tied on with string onto presents wrapped in brown paper. The tricky part was getting the holes central is I only had a standard hole punch rather than a single puncher – I think I might invest this year. After lots of lovely compliments on my wedding invites and some husbandly encouragement from Jamie I thought I’d finally go ahead and put some time into making a little website to keep a record of the various designs and things that I’ve created/will create. I don’t have any massive ambitions for this website – but when people ask about cards or anything else I make it will be nice to have somewhere to direct them. 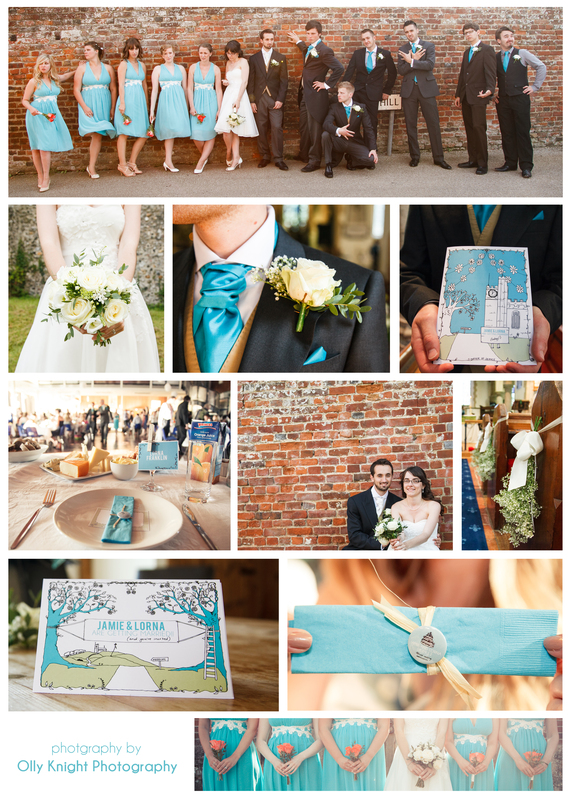 So to start here is a pretty montage of some fit wedding photos taken by Olly Knight so you can see some of the wedding stationery I created in the context of the wedding…. I don’t intend for all my posts to be wedding focused (so don’t worry this isn’t a wedding blog Katy) but as that’s the most recent project I’ve been working on I thought it would be a good starting point.